Draw AC power from your boat’s battery bank. Ideal for less sensitive equipment. For less sensitive AC demands, boaters can take advantage of the lower cost of a modified sine wave inverter. Kisae True modified inverters use an electronically produced waveform to mimic grid supplied AC power from your boat’s battery banks. The result is power with slightly higher harmonic distortion that is compatible with all but the most sensitive electronics and variable speed motors; these sensitive loads can be damaged or have a shortened life using a modified sine wave inverter. This modified sine wave inverter is easy to use. Two standard three-prong 120V GFCI outlets are built into the front of the inverter for ‘plug and play’ operation. LED indicators display system status including power and fault. Kisae inverters have built in safety features to protect the inverter and the boat’s electrical system. To prevent battery damage, a low-voltage shut-down will turn OFF the inverter if batteries dip to 10.5V; an alarm will sound to provide time to save your work (if on a computer) before AC is cut off. Overvoltage protection shuts down the inverter at 15.5V. In extreme temperatures, the inverter will also shut down to prevent damage. 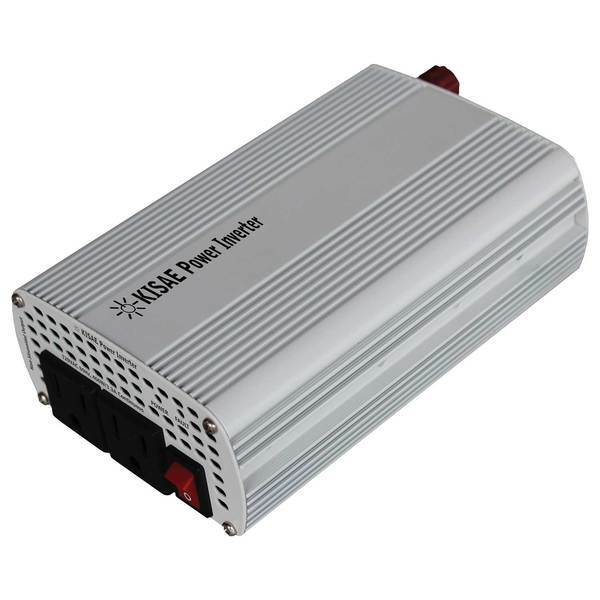 The 400W continuous rating makes this inverter ideal for boats with minimal AC demands or as a dedicated inverter for a specific AC load. Great for running an entertainment equipment, smaller TVs and smaller monitors. Not recommended for heat generating appliances such as coffee makers, microwaves and refrigerators. The 800W surge capacity will allow spikes caused during start-up of AC loads without blowing a fuse or tripping a breaker. Continue to enjoy the convenience of using appliances and power tools when you are away from the dock by converting DC battery power to a safe AC power that is compatible with most loads. Install a Kisae Modified Sine inverter and get more out of your house bank batteries. Ideal for boats with minimal AC loads or as a dedicated inverter to a specific AC load. WARNING: This product can expose you to chemicals which are known to the State of California to cause cancer, birth defects or other reproductive harm. For more information, go to www.P65Warnings.ca.gov.